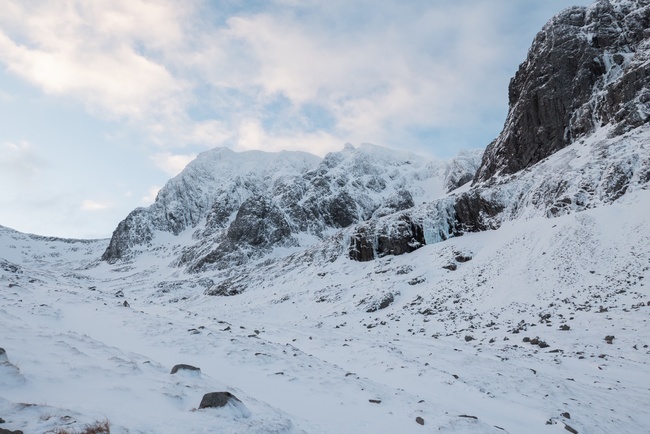 The first weekend in March saw 29 AMC members head north of the border to the Scottish highlands for a long weekend of walking, mountaineering and winter climbing. 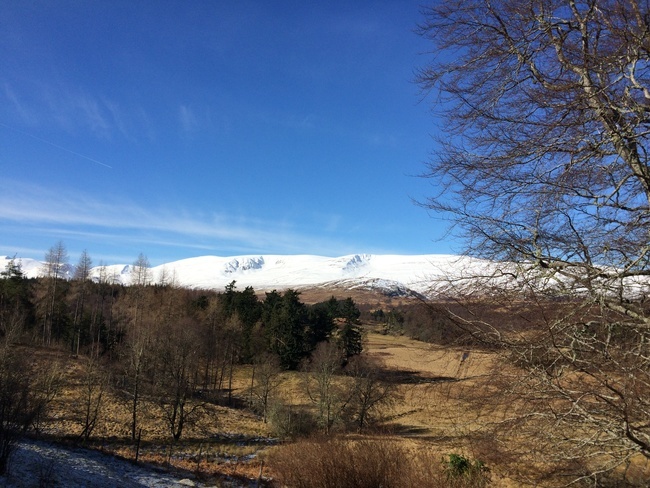 We returned to stay on the Ardverikie estate in Laggan, a great location for access to Creag Meagaidh and equidistant from Aviemore (Cairngorms) and Fort William (Nevis area), with Glen Coe also being within travel distance for a day. We were staying in the Farmhouse and 3 other smaller cottages, all perfectly set up for an enthusiastic bunch of hardy Bristol dwellers with fires, comfy beds and plenty of room for socialising should the weather not play ball. 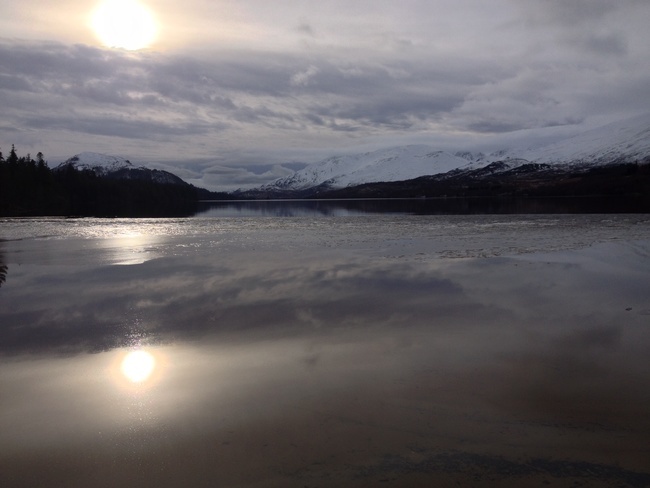 The estate has lots of low level walking directly from the door, with easy access to a number of Munros. The loch provides an option for swimming for those so inclined (there was at least one potential this year, although the water proved a little too chilly) and for those who wanted a day or two of R+R, plenty of options for this. Al and Becky had spent the previous 5 days enjoying perfect weather with great mountaineering and climbing days out. See Al’s blog here for an insight as to why there is a need to carry suncream in Scotland in February (well, if you’re ginger anyway) and some nice photos too (http://mp-m.uk/zIBSa and http://mp-m.uk/1DovB). We were all hopeful that the weather would hold and we would have at least some dry spells to make up for the soaking many of us had had on multiple days last year. Many had set off at an unsociable hour to catch the redeye flight from Bristol to Edinburgh on the Thursday morning, with others choosing to drive up, spending a night en route further south in the Borders or Lake district. As has become the norm, enthusiasm to make the most of the four days meant heading straight for the hills despite the early morning start. 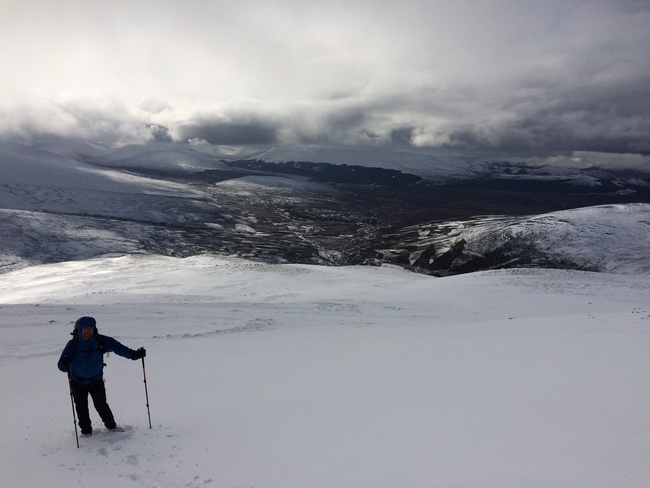 Ela enjoyed her first Scottish winter Munro with Rich on A’Bhuidheanach Bheag and Izzy, Dave M and Sarah hit other Munros en route off the A9. The Marks, Sam, Chris and Roz took advantage of the estate gate key and drove up the estate track to get closer to the mountains, only to discover that the hire car’s suspension was on the low side resulting in a requirement to walk after all! A whiteout on the summit of Beinn a Chlachair sadly precluded any decent views. 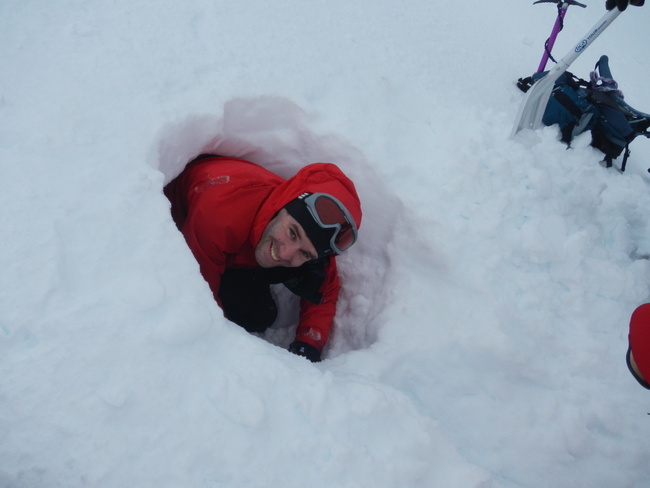 For entertainment, and perhaps to warm up, a number of the boys embarked on elaborate snow hole construction. Despite a chilly start due to queuing, Becky enjoyed her hardest climbing yet with Al on Fingers Ridge in perfect sunny conditions (http://mp-m.uk/xEL9A). 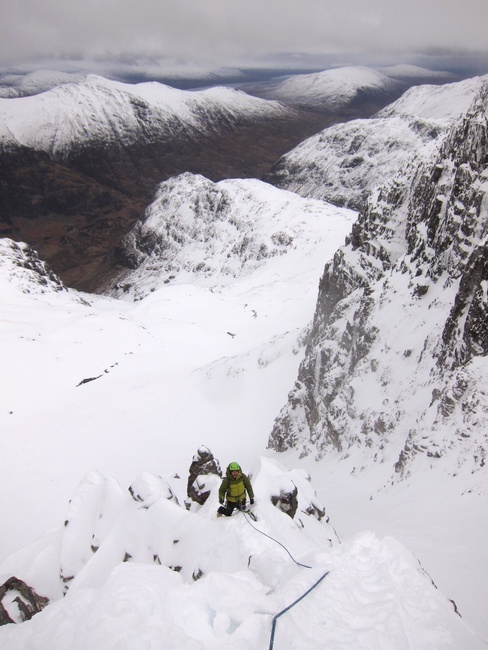 Rob, Dan and Steve headed west from Edinburgh to enjoy great conditions in Glen Coe, giving Rob his first winter climbing experience in Stob Corrie nan Lochan, with Steve doing his first winter lead. The early morning start was felt on the legs following long walks in and out. Friday morning saw a very early start for a number heading up to do routes on Ben Nevis. 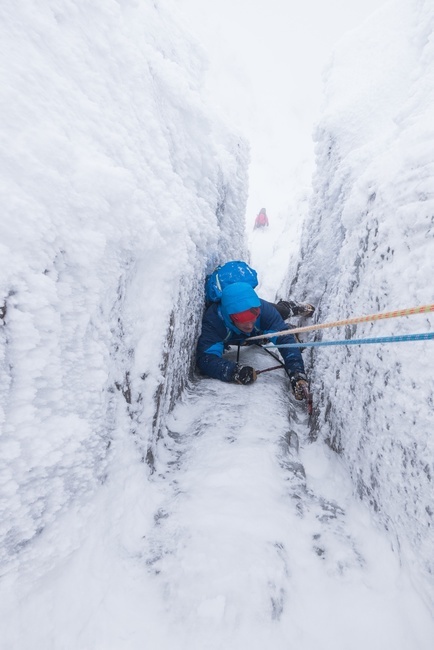 Unfortunately due to the wind picking up making conditions difficult, and an unfortunate crampon breakage, the teams didn’t manage their primary objectives. Not to be deterred, lower routes were completed by some whilst others consumed large amounts of tea and cake at the ski resort. 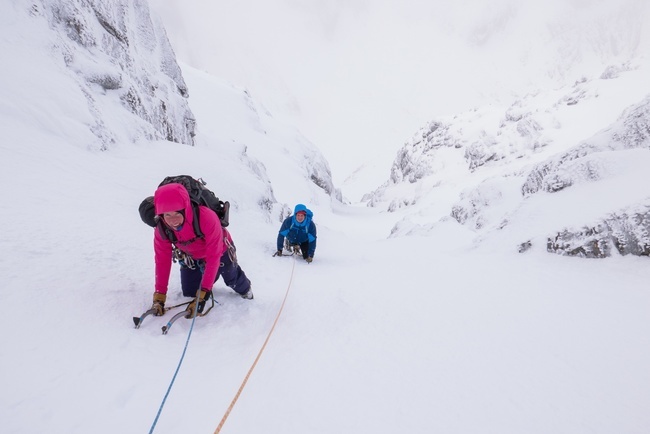 Dan, Neil C and Rob headed to the Northern Corries and were joined by Izzy and Mark consolidating their recently gained Norwegian ice climbing skills, as well as Neil H and Richard. 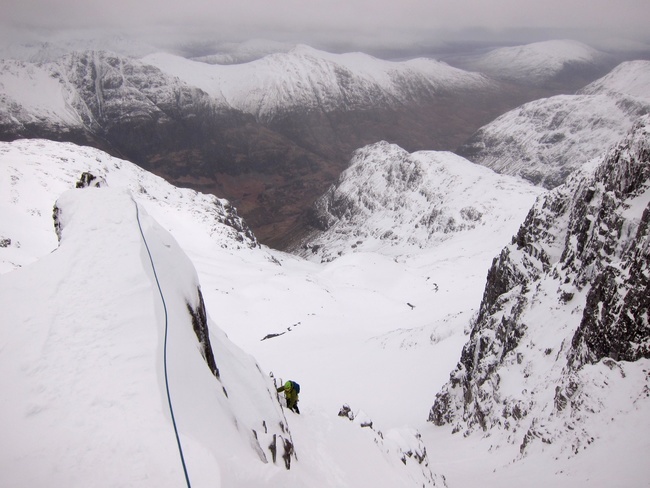 The conditions were great and despite some queuing, all had successful days climbing. Julian and Anne headed off to the Creag Meagaidh area, whilst Nigel took Diane out for her first Scottish skiing experience. 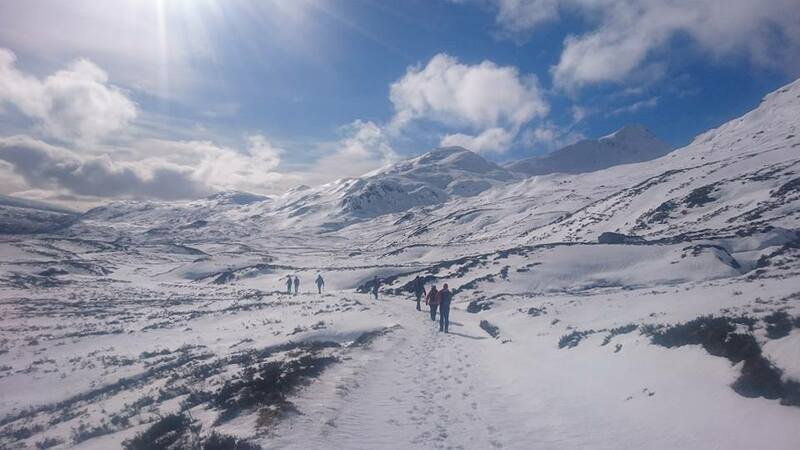 In what must be one of the AMC’s biggest groups heading out together, 14 of those who hadn’t spread themselves across the Cairngorms and Nevis area headed into the Grey Corries for a beautiful walk into the Lairig Leacach Bothy and were rewarded with stunning views and sun all day. Of those remaining, one pair had objectives on the west face of Aonach Mor. Despite getting the first gondola, the walk-in was fairly arduous, with pretty deep powder and gusty winds. 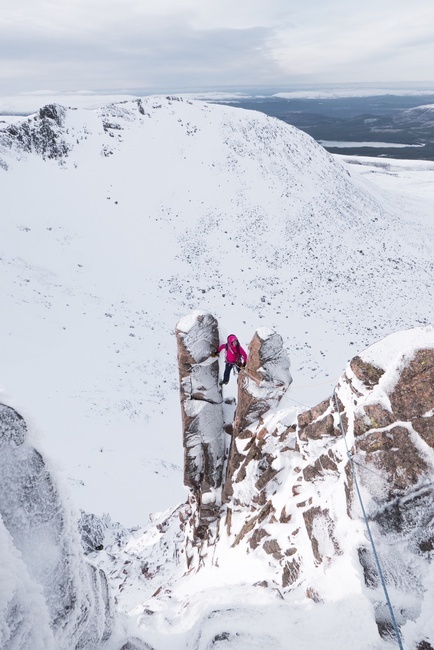 An exciting day with variations on the normal start of Daim Buttress and some pretty difficult conditions led to summiting a little later than anticipated, resulting in missing the last gondola down giving a rather arduous walk out and a late return home. Back on the estate the arrival of the Dave Q, the return of those from the Ben and those having a chilled out afternoon saw the opening of bottles of fizz to celebrate Becky’s birthday and duly a hearty communal meal of chilli was consumed followed by birthday cake. Dinner was saved, and later much appreciated by the returners from Aonach Mor. 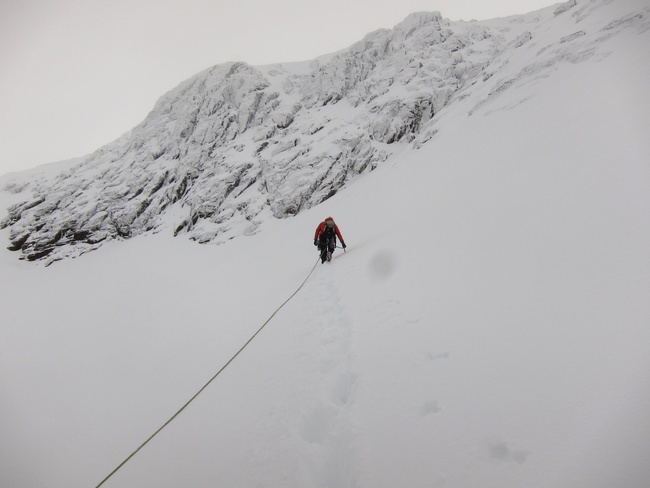 Saturday morning brought another early start for Chris T and Al who headed back to The Ben to do Minus Three Gully (see Al’s blog http://mp-m.uk/Q50pO). Neil C and Jon headed to Aonach Mor and had a great day, despite little visibility doing Golden Oldie. Ela, Rich and Izzy, keen to bag some more Munros headed up Geal Charn climbing Creag Pitridh en route. Wanting a slightly more relaxing start after their late night, some of the boys headed to the Nevis range for a days skiing, this time ensuring they made the last gondola down. Dave Q and Becky headed off Munro ticking. Hoping for views across the Cairngorms from the summit of Meall Chuaich, it was a little disappointing that clouds descended for the last 100m of ascent but at least they stayed dry, a vast improvement from their outings last year. Sunday was forecast to be clear and sunny and people headed off in all directions. Chris, Dave Q, Mark M, Sarah F and Roz headed back up the estate road, this time in Mark’s van (decent suspension) with a repeat of Izzy, Rich and Ela’s routes from the day before. Although the summits were in cloud, several party members forgot the essential SPF30 and got sunburnt. 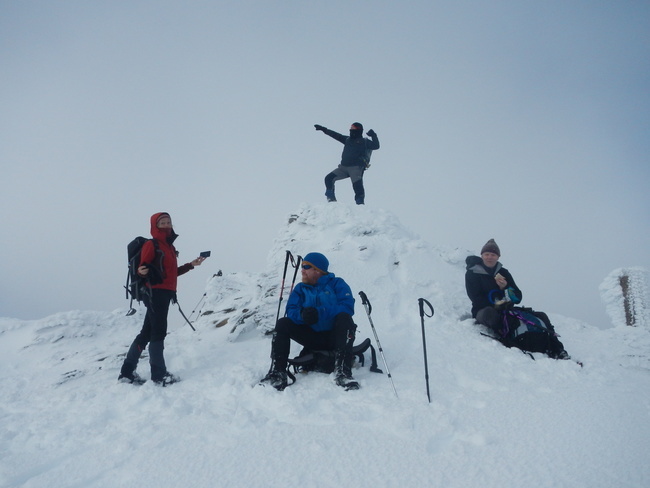 Lucy and James had skiing plans doing the Northern Corries loop however poor weather prevented much progress with this. 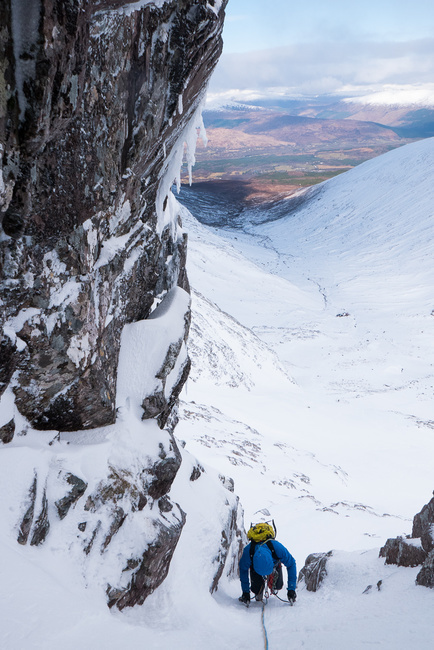 Dan, Rob, Tom, Neil C and Steve headed to Coire an Sneachda, all completing the Grade 3 classic route Hidden Chimney which was in great condition. Mess of Pottage was busy with teams that day and the closing weather conditions prevented any further ascents but Rob, in typical birdwatching manner, got quite excited spotting a flock of snow buntings in the ski resort carpark at the end of the day. Monday morning dawned sunny and clear – perfect mountaineering conditions which made leaving so much harder, especially for those who had the long drive all the way back to Bristol. 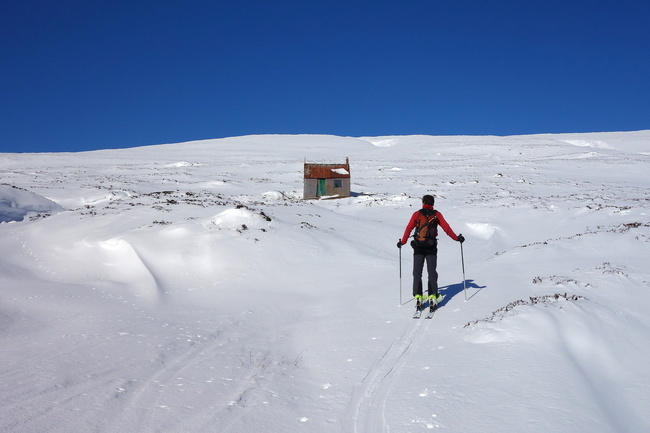 Some managed shorter walks en route to Edinburgh airport and Lucy and James had a fantastic day out skiing with cloudless summits on A’ Chailleach. Rich, Ela and Dave Q, who were staying on for more days of walking, also had a beautiful day increasing Ela’s Munro tick list further with summits of Chno Dearg and Stob Coire Sgriodain. Overall, a fantastic trip with everyone getting out on multiple days. 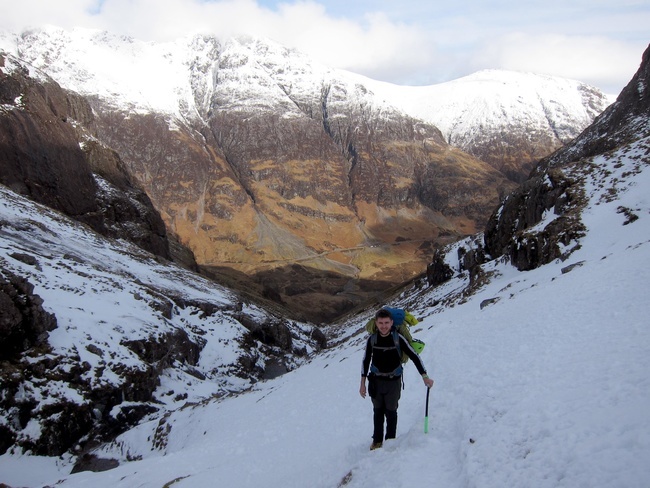 Plenty of firsts – winter Munros, winter climbing, leading, skiing and long awaited first ascents of Ben Nevis. The weather was better than could have been asked for, company always good and miles walked extensive. Looking forward to returning for views like this in March 2017.